Inventory We are a resale marketplace, not a box office or venue. Ticket prices may exceed face value. This site is not owned by Talking Stick Resort Arena . Talking Stick Resort Arena (formerly US Airways Center) is a sports and entertainment arena located in downtown Phoenix, Arizona. It opened in 1992, and is the home of the Phoenix Suns of the National Basketball Association, the Phoenix Mercury of the Women's National Basketball Association, and the Arizona Rattlers of the Arena Football League. The arena, which is situated near Chase Field, is named after its sponsor, US Airways. After America West's merger with US Airways, it was announced that America West Arena would be renamed to US Airways Center on November 14, 2005 with the name change taking place in January 2006. 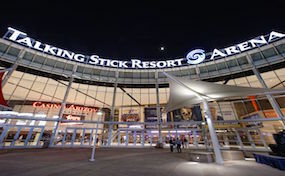 Recently in August of 2015 the name was changed to the Talking Stick Resort Arena. The TalkingStickResort.ArenaPhoenix.com is a privately held company that specializes in the sale of tickets in the secondary market. We are not affiliated with any official supplier or box office. To purchase tickets to any Talking Stick Resort Arena in Phoenix events simply call our operators at anytime or click on the event you wish to attend.